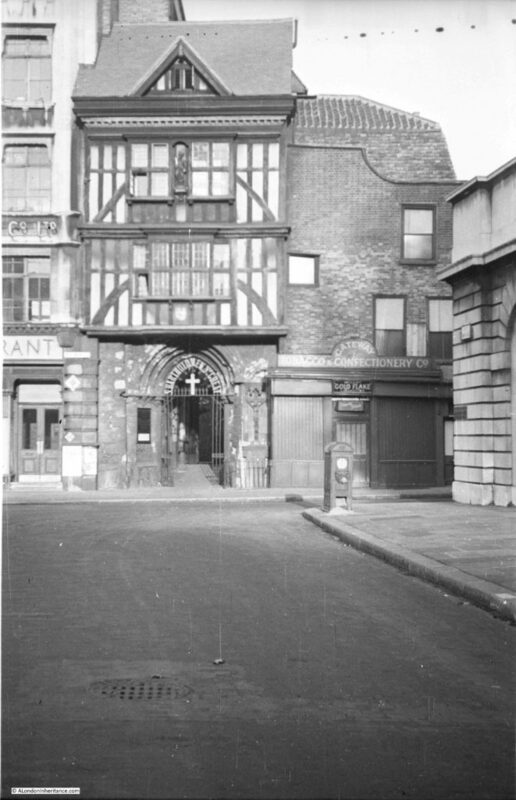 For this week’s post I am in West Smithfield, at the gatehouse entrance to the Priory Church of St Bartholomew the Great. The photo below is my father’s post war photo of the gatehouse. And in the following photo is the same view on a rather damp and overcast January morning. The gatehouse building is basically the same apart from some cosmetic differences as is the building to the left. 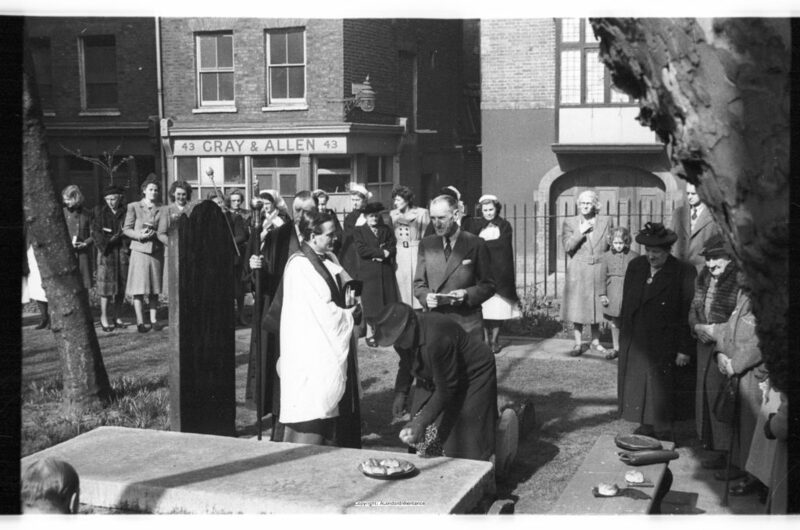 The building on the right is of a similar style to the original but was part of reconstruction work carried out between 1950 and 1952. 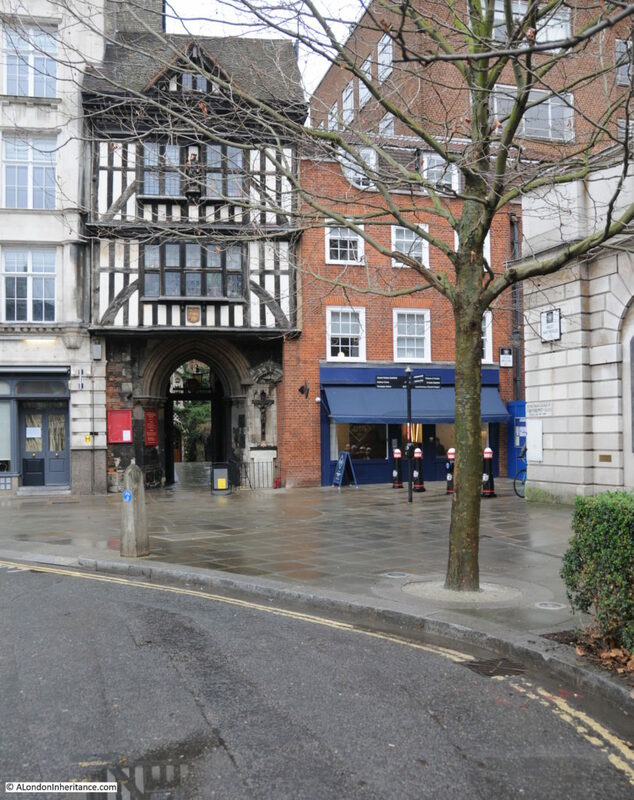 The other difference is that road running to the right has been pedestrianised along the length leading out into West Smithfield with an additional large area of paving in front of the gatehouse. The gatehouse entrance now opens onto the path leading to the church with the graveyard on the left, however originally the church of St Bartholomew the Great covered the area now occupied by the graveyard and path. The stone entrance of the gateway is part of the original 13th Century doorway to the south aisle of the church. The timber framed building above was added in the 16th Century. The following plan of the original layout is displayed within the church. 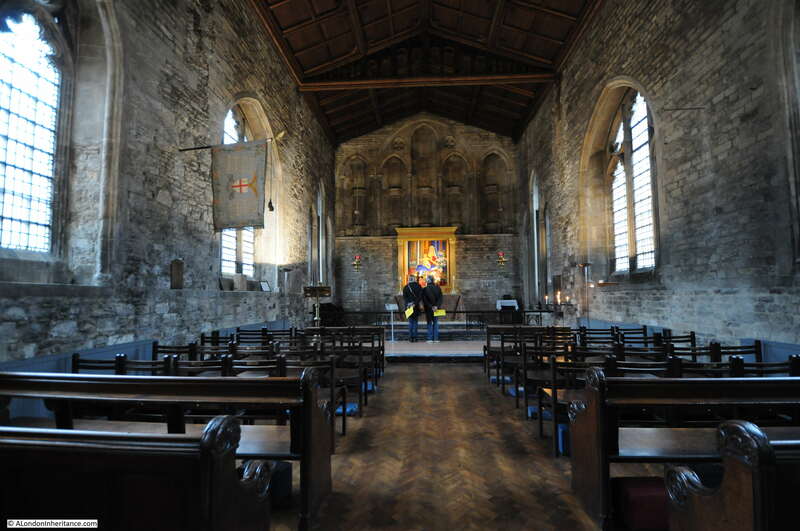 The nave is the area that once occupied the space which is now the graveyard and the South Aisle is the path from today’s entrance to the church up to the gatehouse, of which the original stonework is shown by the dark green at the left hand end of the South Aisle. For many years, the timber framed upper floors of the gatehouse were covered by a later brick and plaster frontage. The timber framework was uncovered when the gatehouse suffered damage from nearby bombing during the First World War. The brickwork was later removed and the gatehouse restored to the condition we see today. The following photo from Getty Images shows the gatehouse before the First World War with the plaster and brickwork overlay to the original timber frame. The buildings on either side of the photo are the same as in my father’s photo however the building on the right was occupied by the Stationers & Bookbinders Evans & Witt at the start of the 20th Century before changing to the Gateway Tobacco & Confectionery Company by the time of my father’s photo. 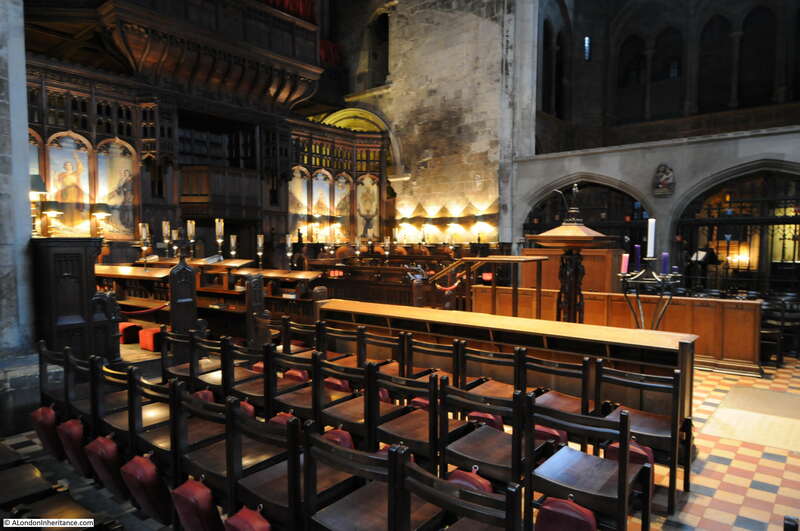 Walk through the gatehouse and this is the view of St Bartholomew the Great. This whole area would once have been covered by the original church and the path leading up to today’s entrance was once the south aisle. The raised area on the left, formerly the nave, is now the churchyard. 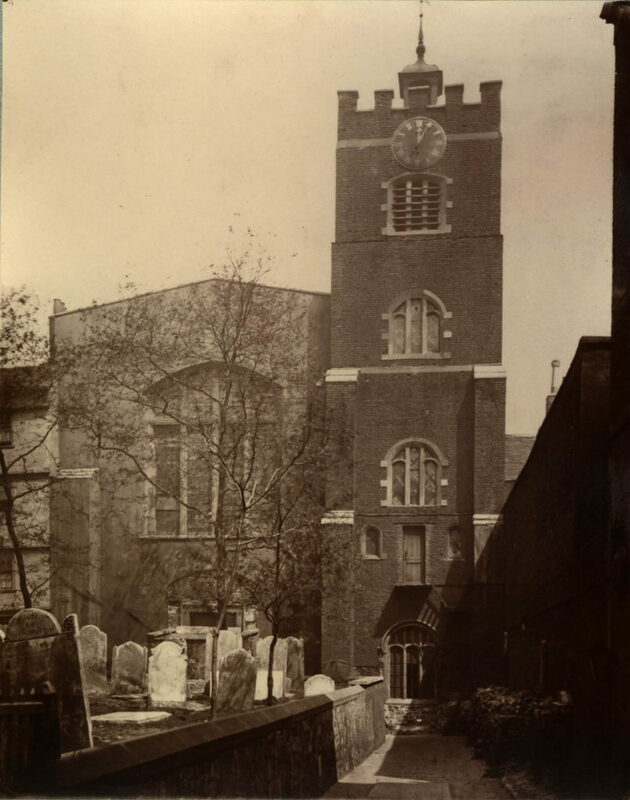 And in 1739, houses in Cloth Fair, the street to the left of the church, formed a boundary along the churchyard. 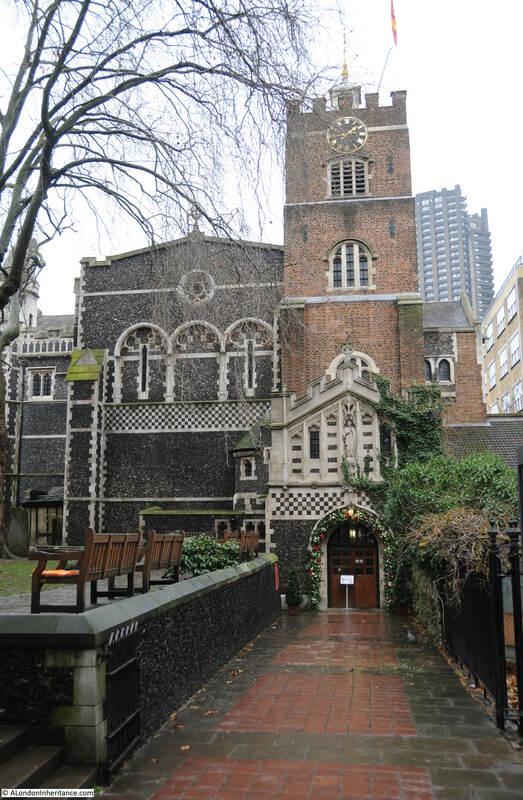 St Bartholomew the Great was founded in 1123 by Rahere, a prebendary of St. Paul’s Cathedral. The story goes that Rahere was originally a Jester or Kings Minstrel, however after the death of the King’s wife and children Rahere traveled to Rome where St Bartholomew appeared to him in a vision and commanded him to build the church. 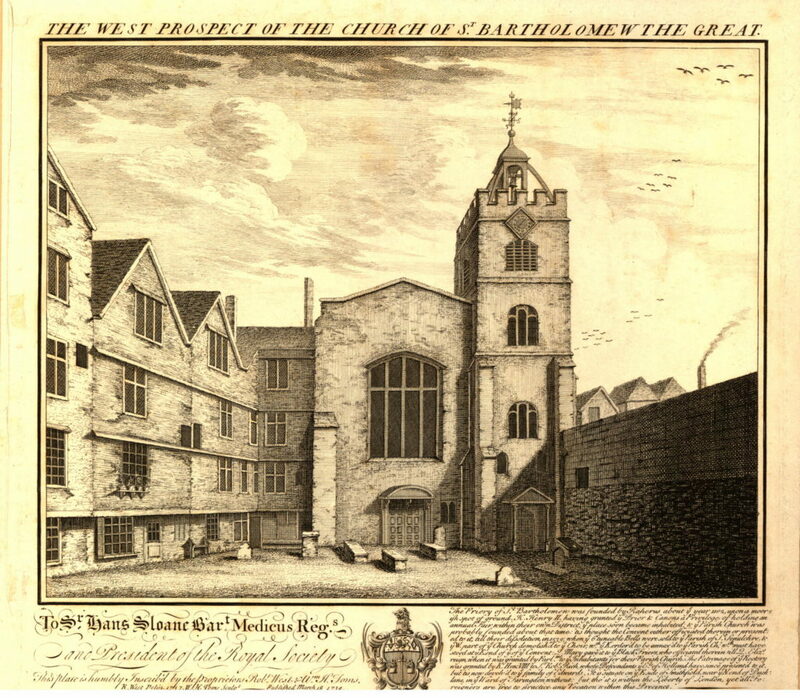 He established the church as an Augustine Priory (possibly on the site of an earlier parish church) along with the adjacent hospital of St. Bartholomew. The current tower was built in 1628 and for the following centuries the church went through periods of decay, restorations, parts of the building were pressed into different use such as a school and workshops and the buildings of Cloth Fair crowded close up to and sometimes within the fabric of the church. The church survived both the Great Fire and the Blitz. 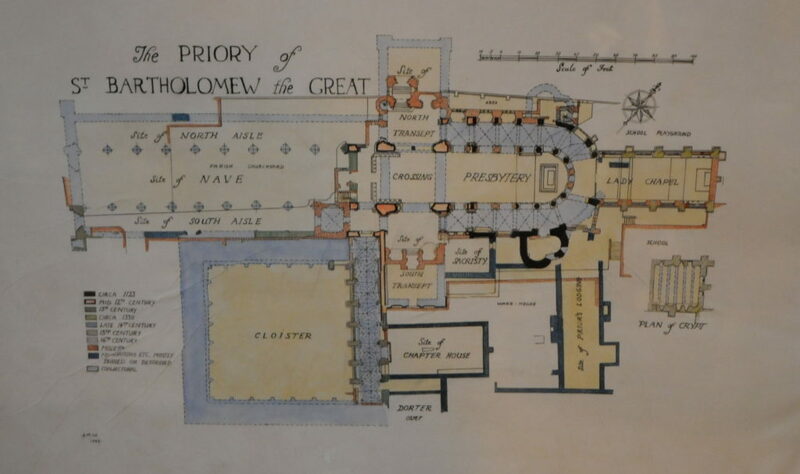 The restoration of the church to the state we see today began around 1886 lasting through to the early 20th Century, including the work on the entrance from West Smithfield. Time to have a walk around the church. My visit was on a wet Saturday in January, the type of day that is much underrated for a visit to this type of building. They are generally much quieter and the dampness and limited light at this time of year seems to make the history and fabric of the church far more visible. 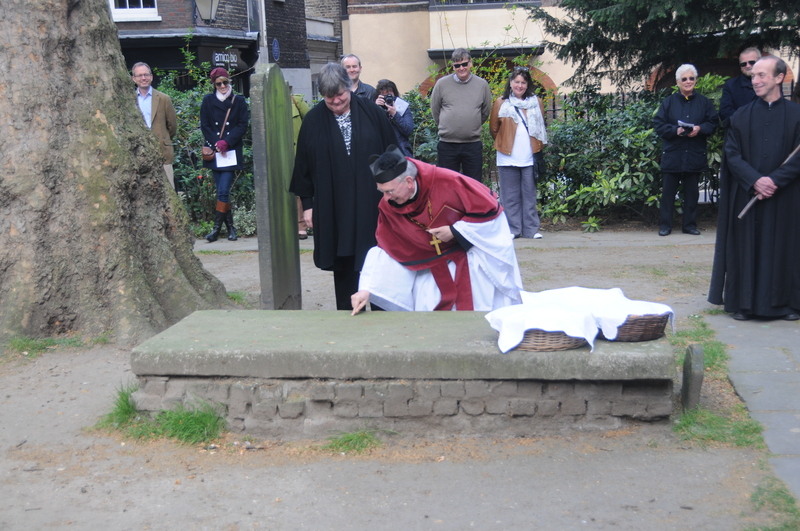 On the right of the church is the Font which dates from 1404. 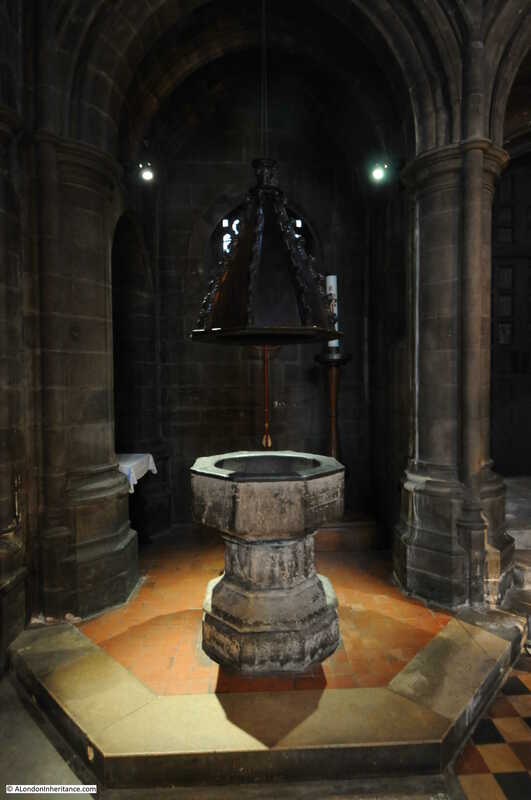 It was at this font that William Hogarth was baptised on the 28th November 1697. He was born close by in Bartholomew Close. He also was responsible for the magnificent murals along the stairs leading to the Great Hall of the adjacent St Batholomew’s Hospital. 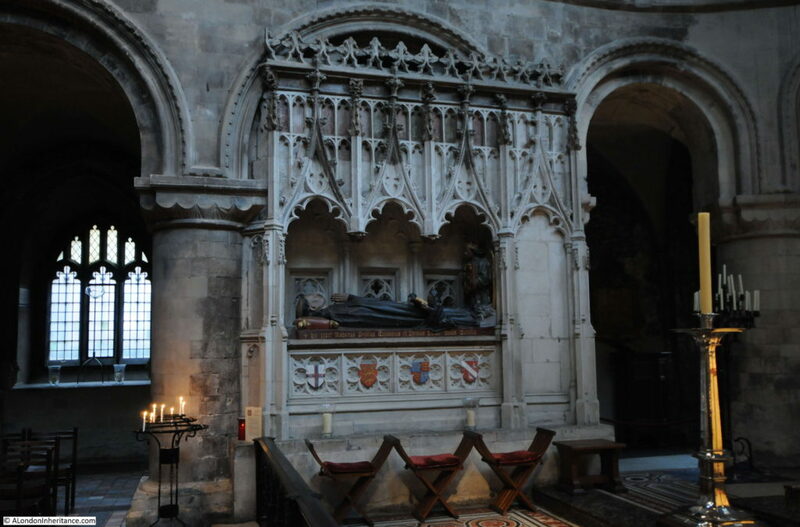 The tomb of Sir Walter and Lady Mary Mildmay. The founder of Emmanuel College, Cambridge and Chancellor of the Exchequer to Queen Elizabeth 1, Mildmay died in 1589 after Mary who died in 1576. 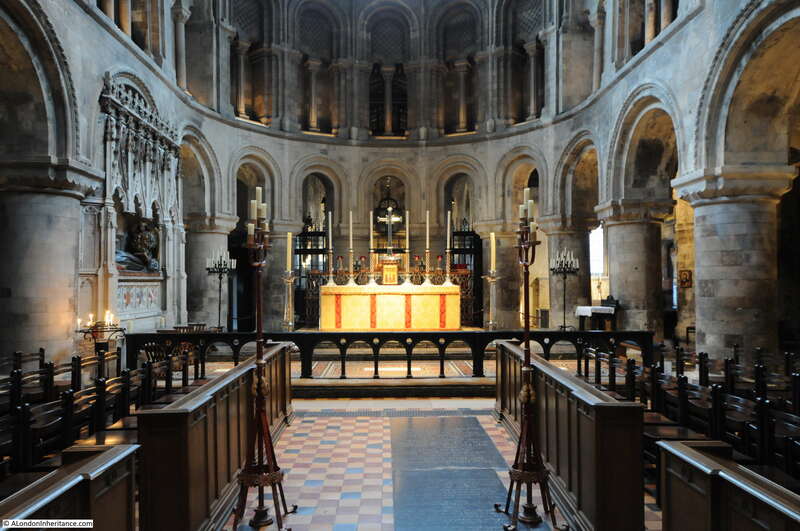 There are not that many monuments in St Bartholomew the Great, probably due to the many periods of reconstruction, loss of much of the nave and the different uses to which the church has been put, however those that remain are impressive. Doorway through to the Vestry, much of which is the original medieval stonework. He continued to work for Henry VIII and was responsible for a number of construction projects in London and across the country. The King’s Book of Payments include records of payment to Bolton of over £5,000 for work on New Hall, near Chelmsford in Essex, a considerable sum of money at the time. Looking back down the South Aisle. In the original medieval church, this view would have been twice a long, all the way to the gatehouse. The Lady Chapel at the east end of the church. After the dissolution, from 1539 all the way to the 1880s this part of the church buildings was used for alternative activities including use as a house and as a printing works. 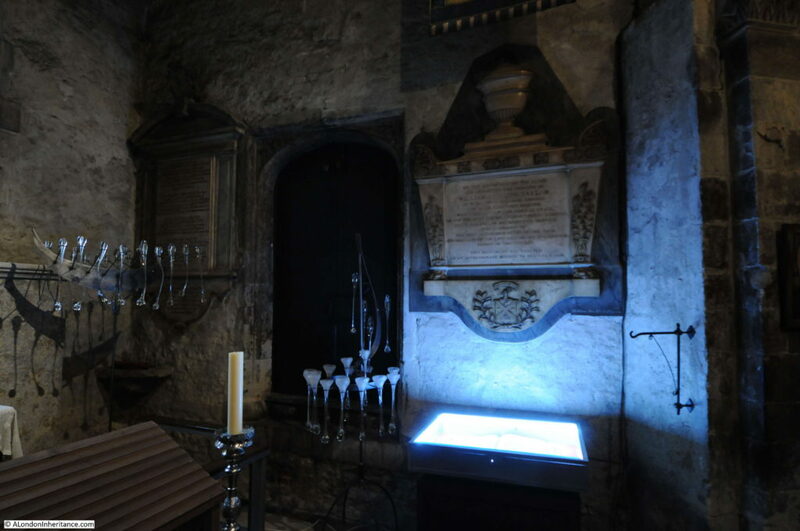 Beneath the Lady Chapel are the remains of the original medieval crypt. During the 19th century restoration work, the crypt had to be dug out and restored having been used for a range of purposes including coal and wine cellars. Parts of St. Bartholomew the Great were also used as a blacksmith’s forge and in a 1916 newspaper report on the restoration work there is a comment that one of the pillars still has smoke staining from the forge – I could not find that today. On the left of the High Altar is the tomb of Prior Rahere, the founder of the Priory Church of St Bartholomew the Great. Rahere died in 1143 and the current tomb dates from 1405. The potential for damage during the Zeppelin raids across London during the First World War, and which assisted with the uncovering of the original gatehouse, resulted in precautions being taken to protect many of the ancient artifacts across the City. 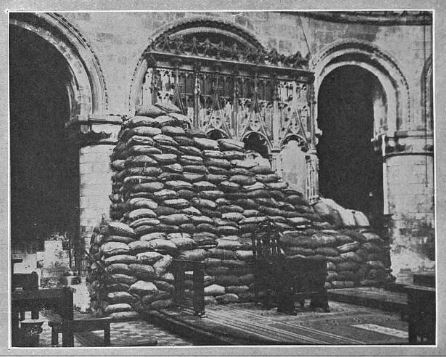 In St Bartholomew the Great, the tomb of Rahere was sandbagged. Another or Prior Bolton’s additions to the church, an oriel window as seen from the Choir. On the base of the window is Bolton’s rebus, or personal symbol consisting of a crossbow and a cask. The story continues that the minister offered to resign the living if his parishioners would give him a certificate of good conduct to assist him elsewhere. As they were anxious to be rid of him, they provided the certificate, however he then refused to go. The problem for the parishioners was that they were either open to a charge of falsehood or of collusion with their minister. Looking from the Choir towards the great lectern, the choir stalls and the organ. Prior to the loss of the nave, this view would have carried on a considerable distance to end parallel with the existing gatehouse. 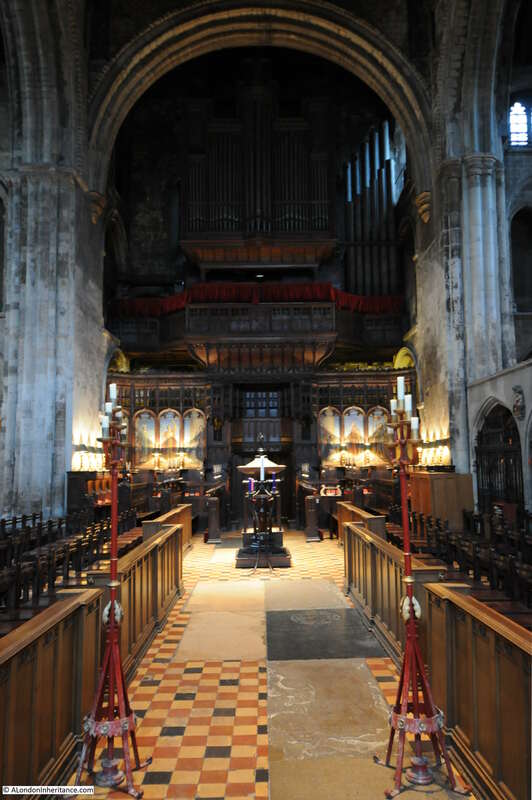 Looking back up towards the High Altar from behind the Great Lectern. Given that originally there would have been over half as much again of the church running back towards Smithfield, the original church must have been an extremely impressive medieval building. Looking back to the western end of the church. 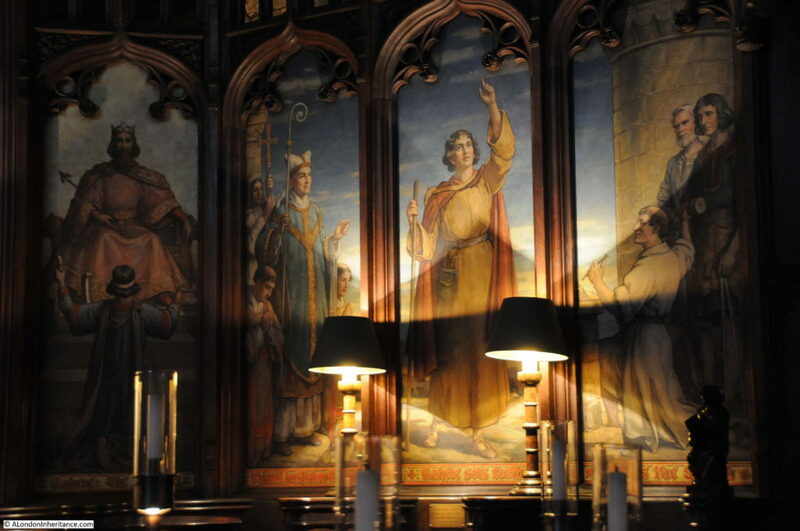 Behind the wooden screen and paintings was the original divide between the Choir and the Nave. Colour on a grey and damp day in January. I suspect my father took the original photo of the Gatehouse on the day he visited the Butterworth Charity which takes place in the churchyard of St. Bartholomew the Great every Good Friday. I wrote about this in April 2014 and you can read more here. The following two photos are one of my father’s original and my later photo from 2014. 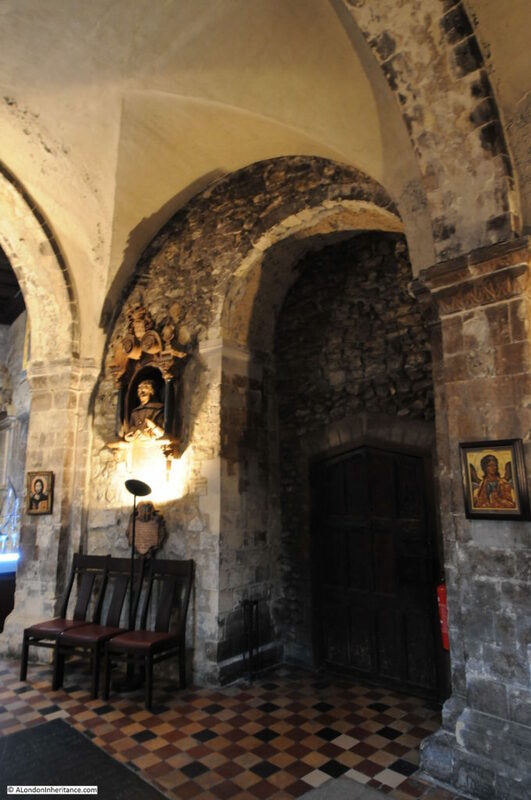 The gatehouse to the Priory Church of St Bartholomew the Great demonstrates what an impressive medieval church this once was as this was the original entrance to the south aisle with the nave running to the left. 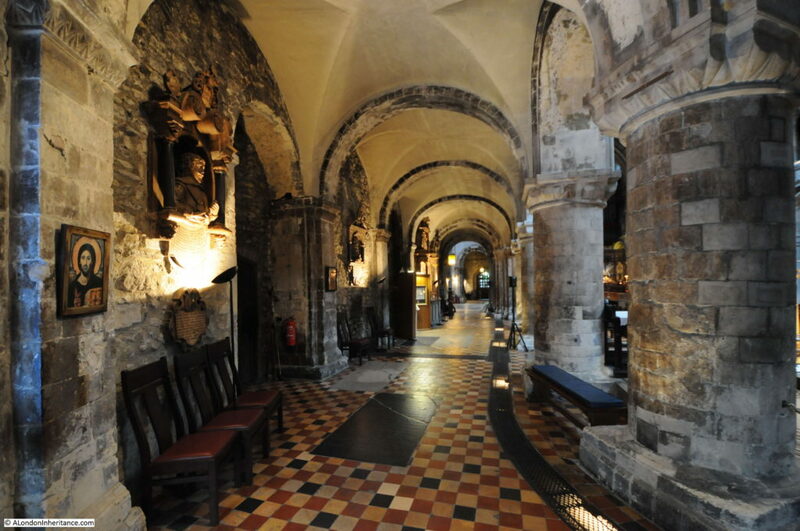 A sense of what this magnificent church must have been like and the impression it must have had on the surroundings of Smithfield can still be had by visiting the church, even if it is not a damp and overcast day in January. This entry was posted in London Churches and tagged Smithfield, St Bartholomew the Great on January 15, 2017 by admin. Re “the steps up to the wooden door into the tower”, I imagine it was the entrance to the bell ringers’ chamber which were often on the first floor. Fascinating account of the church. I have visited it twice before (although not since they started charging!) and yet this article-post taught me some things I didn’t know. Atmospheric photos, too. Many thanks. What a wonderful surprise on a grey and damp Sunday morning in Texas, to see one of my favorite places in London so beautifully illustrated by photos old and new. I have stayed several times in the Landmark Trust properties across Cloth Fair from the churchyard, and came to love the area very much. No other part of London retains the medieval spirit that I have felt there. Thanks very much for this posting. I always enjoy your posts, but this one was very special to me. At last… a part of London on these pages that I had actually discovered for myself before I read about it here! I don’t imagine it will happen again for a long time! One snipped that I don’t think is mentioned is that the rebuilding etc work of the late C19 and early C20 was done by Sir Aston Webb, who of course is responsible for many famous buildings around the British Isles. And I didn’t know that there were Landmark Trust properties in Cloth Fair (thank Kathleen Munden) – I might follow up on that too. We have visited St. Bart’s on many of our holidays from Pennsylvania, USA. My first impression was that I fully expected to see knights in armor emerging from behind the pillars. The “oldness” of St. Bart’s made a lasting impression on us. On our first visit we had the good fortune of meeting the verger at that time, Philip Stewart, who was, oddly enough, from Chicago, IL. 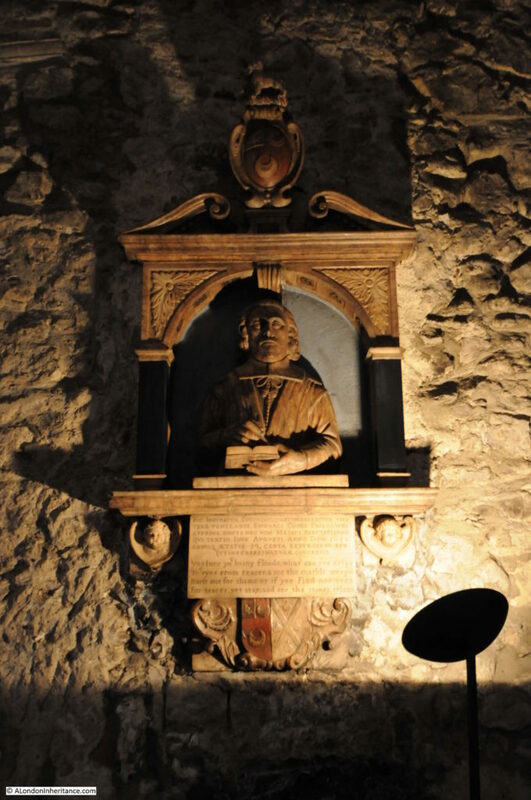 He proved to be a wealth of knowledge on St. Bart’s structure and history. 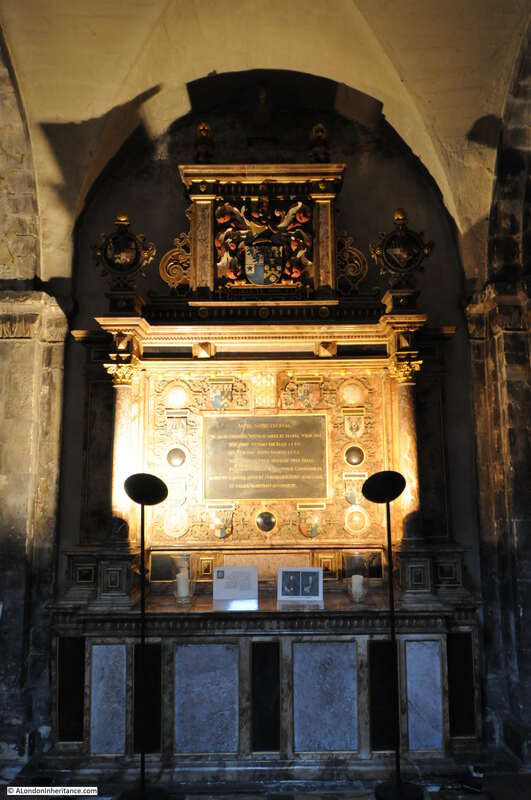 We stayed in touch with Philip and visited each time we came to the area and continued to visit him once he had left St. Bart’s to live in Charterhouse. Philip became, to no surprise, well versed on the history of the Charterhouse also. It was sad news to learn that Philip passed away a little over a year ago. We miss his friendship. My School was named after and started in the Gatehouse. We performed our Nativity Play each year in the church. 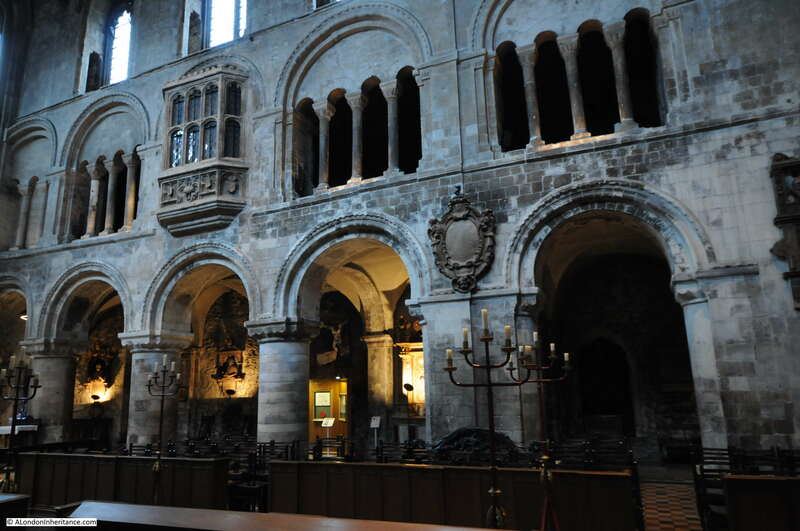 I visited St Bartholomews Church yesterday on the strength of your blogs. Thank you. It was really great to appreciate the church and area through your pictures. A piece of social history brought to life. 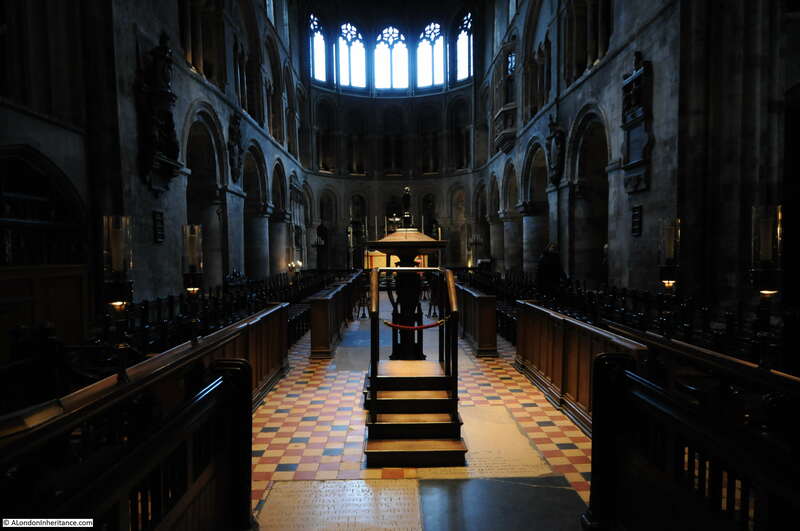 I was in London last weekend and took the opportunity to walk around by St. Bartholomew’s Church. Great to see all this information here. My Uncle and Aunt were married here in 1947, my Mum and her brothers attended the school, which was attached to and was part of the church, in the 1920s and 30s, their headmistress was Miss Guy and two of their Governors were Seely and Pagett, the architects who lived in Cloth Fair. A wonderful area, so full of history. I have recently discovered that a WW1 Memorial in this great church is dedicated to Private Harry Ely Waldron # 51613 1st Bn Lincolnshire Regiment who died 20.9.1918 aged 29. I have passed the information on to his brother’s descendants who will be pleased to visit his memorial soon.